A dairy cow's average working life is around four lactations; unfortunately, some cows are subjected to unacceptable conditions that lead to a shorter production period. Poor housing can have an adverse effect on a cow's health and welfare, with one of the major considerations being the floor. Grooved for maximum traction. Cows walk naturally on Tuff Trac Rubber. Even when wet the non slip surface allows cows to walk confidently. Concrete floors that are roughened in an attempt to preclude slippage can wear hooves excessively, and smooth floors do not offer sufficient traction. There is a fine line between a concrete floor surface that is too rough and causes injury due to abrasion and one that is too smooth and causes injury because of inadequate footing. Experience has shown that the finish on a floor is often the biggest mistake made during barn construction. Rough finished floors will speed foot wear by up to 20 percent, with cows being culled in three weeks of new barn occupancy due to lameness (Bray, 1998). Proper groove width, spacing, and depth. Steel Reinforced mine belting offers maximum strength and duribilty. With a non slip area to exit after milking, cows move quickly and safely back to the free stalls. When installed with the correct dimensions this is a fantastic place for rubber. Cows eat comfortably on the rubber with front and back feet on rubber. There is room for vet checks behind the cow on rubber and another walkway for good cow flow. Call us to get a quote and a layout of your dairy!!!! Holding pens are a stressfull area. This is a critical place for rubber. The installation of rubber mats significantly reduces the cold and humidity from the base flooring; its insulating properties help to protect cows against rheumatism and fatigue. Rubber mats are easy to clean and disinfect- they are non-porous and do not retain moisture. They also have better waste drainage which ensures better sanitary conditions. A healthy cow walking on pasture places the rear foot into the position vacated by the front foot on the same side. 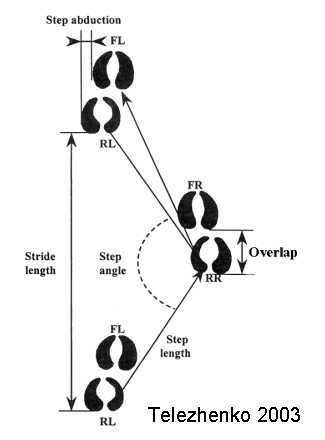 On slippery floors or in dark conditions that alter a cow's confidence, she places her rear foot outside the track of the front foot, alters stride and step length and walking speed. This altered walking behaviour provides greater stability but places greater stress on the outside claw. 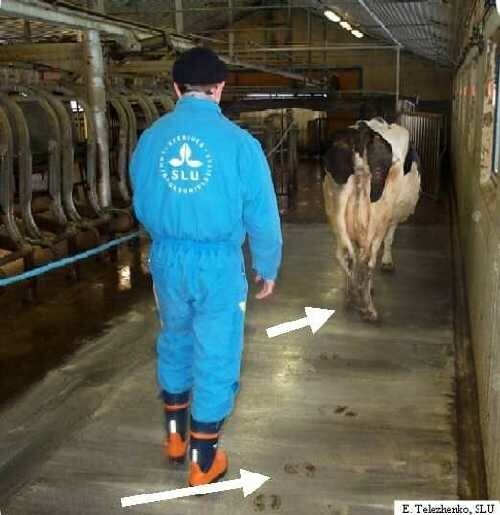 Choices of flooring and lighting influence walking behaviour, foot health and cow movement. Foot placement, length of stride and step and walking speed are a few items of locomotion pointing to walking behaviour. Figure 18a. Claw prints of a cow show several components of walking - including stride, step, step angle, overlap and abduction. Observation of walking patterns provides an opportunity to assess floors for traction and flatness of surface for the claw to rest upon. In addition, "birdbaths" in concrete floors are health risks that pool wastes, contaminate feet and tails and allow splashing onto beds, teats or legs. Figure 18b. A cow's foot placement and walking speed change with confidence in the flooring or lighting in a barn. A mixture of lime and water brushed onto the floor shows the cow's tracks and her altered locomotion to gain stability on the slippery concrete flooring.